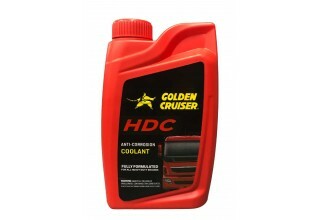 Golden Cruiser Heavy Diesel anti-corrosion coolant has a highly advanced technology of slow-depleting organic acids which will provide full anti-corrosion protection. It is recommended for all makes and models of heavy vehicles like trucks, buses, off-road and stationery engines including those of European, Japanese and American origin. Flush & clean cooling system with radiator flush or clean water. Install Heavy Diesel by adding 1 part coolant with 4 parts soft clean water. Golden Cruiser Heavy Diesel can be used up to (-) 5°C after dilution.